The Sistema Microwave Collection Steamer is designed to conveniently cook vegetables, fish, and poultry in the microwave. The lid features a steam release vent for splatter-free heating and cool-to-the-touch, easy-lift tabs. The middle stalk of the removable steamer basket stays cool so you can lift food out after cooking. 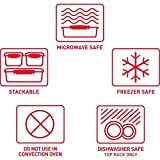 Made from 100% virgin plastic, this BPA- and phthalate-free food storage container is dishwasher-safe when placed on the top rack, microwave-safe with the vent open, and safe for storing in fridges and freezers. 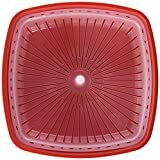 Interested in the Sistema Microwave Collection Steamer, Medium, 83.5 oz./2.4 L, Red? Is the price too high? You can easily price watch this product and we'll notify you when the price reaches your target.